For nearly fifteen years Corb Lund and The Hurtin’ Albertans have taken their brand of country music from the Canadian Prairies of their homeland to America’s heartland, steadily building a growing fan base one show at a time. With the release of Cabin Fever in 2012, Lund achieved the commercial success to go along with the critical acclaim that he had been receiving for years. The album debuted at the top of the Canadian Billboard Chart, overtaking pop stars Justin Bieber and One Direction. American success hasn’t came as quickly. Other than an appearance on RFD-TV’s Marty Stuart Show, and a song on the soundtrack of the 2006 James Gunn horror film Slither, exposure in the states has been a word of mouth process—a process that is proving effective, based on the response from his first show in Iowa, for a packed house at Iowa State University’s Student Union. The reaction surprised even a seasoned road veteran like Lund. Lund took time recently to sit down with TJ Spurgin to share his experiences recording his latest release Counterfeit Blues at the legendary Sun Studios in Memphis, Tennessee as well as what he has been up to this summer reuniting for a few dates with his former band The Smalls. Drunk Monkeys: You recently reunited with The Smalls for a few dates. How was that experience? Corb Lund: It was kind of intense, we hadn’t played in fifteen years and we jumped right in and played two shows with 20,000 people apiece. It’s kind of complicated and challenging music, kind of intense. I was playing stuff I hadn’t played in so long it was kind of like a time machine, it was very interesting. DM: It seems you’ve been re-exploring your past a lot lately with the Counterfeit Bluesrecord. CL: Exactly, it kind of funny down here in the states our last original record Cabin Feverhas turned a bunch of new people onto us that don’t know about our old records, in Canada it’s like a wild greatest hits record but down here Counterfeit Blues is brand new material for the people that got on board after our Cabin Fever record. DM: Whose idea was it to go to Memphis to record at Sun? CL: That was originally CMT Canada’s idea. They wanted to do a TV special with a band recording live at Sun. We were one of the few bands that they know is a classic self contained band as opposed to a singer with a bunch of hired guns on a chain. We have been playing together for over ten years so we were well suited for that kind of recording situation, because it’s just one room you press record, you can either play or you can’t. There’s no overdubs, no anything. So we did the TV special. The TV special aired and a lot of people wanted a CD of it. There was no intention of making a CD at first, it was just about the TV. DM: Did you use any of Sam Philips old equipment or has everything been updated? CL: I think most of it has been updated. We used a lot of our own gear. I know the board was updated. I’m not really a recording guy so I couldn’t tell you. I think some of the mics were old some of the mics could of been from that vintage. DM: Do you think they were responsible for the echo effects on Counterfeit Blues or do you think it was just the room? CL: Yeah, I think part of that was intentional, but the room has that. The room has that going on. I think the layout or the acoustics of the room are definitely still there. We literally tried to record it to sound old school without any extra bells and whistles. I think there is a little bit of old-school reverb extra added and some of the tremolo for sure. DM: Was that your first trip to Sun? CL: Yeah, it was. My guitar player is more of a music historian that I am, I think he had been there before as a tourist, but I had never been there. DM: Did you get a unique vibe from all of the history that had gone on there? CL: For sure, like the first hour or two was kind of intense because the pictures are on the wall, and you know the ‘X’ where Elvis stood is on the floor, and the studio manager is telling us all of these stories about Johnny Cash. You get over it once you get down to work, but the first couple hours were kind of sobering. DM: I heard a rumor that your next album will be recorded there. Is that true? CL: Not necessarily, maybe consider it, I haven’t got the songs written yet so it’s too far out to decide on. But you never know. I’m really happy with the way it turned out so it might be a good way to do it. I’m definitely leaning toward a more raw recording style, I like it better. DM: I feel like this album really captured your live sound. CL: I think you’re right. Those are the songs we have been playing for years. We bang them out every night so it does have a very live kind of feel. It is pretty much how we play them live every night without any extra stuff or whatever. It’s a fun way to record but you have to know the material real well though. It’s pretty hard to fix stuff cause everything is bleeding through from each other’s microphones. DM: Tell me a little bit about your songwriting process. CL: It’s painful. I just get chunks, ideas or whatever and I hold up in the woods for a few months and bang them all into shape. They take on a new character when the band gets a hold of them too. I don’t really write all of the words or all of the music first. I usually get a germ of an idea with a lyric or a melody and build on it. Everyone’s different sometimes I like to mix it up. I’ve been co-writing more lately, I never used to do that. I did some co-writing on the last record with some friends. DM: I noticed Jason Boland got a co-writing credit on “Bible on the Dash”. How much did he contribute to that? CL: Not a whole lot. It was pretty early on, but he did give me some ideas. I can’t remember which one, I think it was the part about the border crossing. I wrote the bulk of it and Hayes [Hayes Carll] helped me with a significant chunk to help me finish it. I can’t remember what lines or whatever but Jason impacted the early part of it. I liked writing with him, too. Jason is a great guy. DM: How did you come up the idea for your YouTube video series “What This Song Means Now”? CL: Did you watch some of those? Those we kind of fun to make, they are one third guitar lesson, one third songwriting and one third just rambling, I like those. My manager was telling me I needed to do more online and video stuff and I didn’t really know what to do, but that’s the best way to get a songwriter talking is to ask them about their songs. I did some teaching over the years when I was younger so it came kind of natural. I think they are kind of unique. The way they are set up is kind of original in terms of songwriting, guitar playing or whatever. DM: One of my favorite from the series is “One Left in the Chamber” from the Cabin Fever album. Were you going through a tough time when you wrote that song? CL: I’ve noticed that the people that do like that song really like it a lot. I wrote that with a friend of mine named Matt Skinner. I have gone through those times but I wasn’t [when I wrote the song]. The germ of the idea was Matt’s idea so I helped him finish it. The original darkness of the tune was actually Matt’s. DM: Does it frustrate you the way Nashville refuses to let anything in that has any artistic merit? CL: Kind of. It’s not just this city, it’s music in general. It seems like it might be getting worse, but it’s been like that my whole career really. I just do my own thing, sometimes I get help from the industry and sometimes I don’t. The way I’ve set my career up, I’m gonna do what I do regardless, but it’s whatever. If they want to get on board they can. I think we have different goals. Most of the guys that are on the radio these days, the goal of the consortium or whoever runs their career is to sell as many records as they can to as wide of audience as they can. Guys like Me, Hayes and Jason, part of our goal is to make art, we want to make money too but the art comes first. I don’t think that is always the case with the radio. Just do what you do and hope for the best. The most important thing to me is writing the song, playing the song. I know it sounds cheesy but, expressing myself through it. DM: My first exposure to you was through “The Marty Stuart Show”. Have you had any other appearances on American TV? CL: No that was it. It was good time. Marty is a great guy he is a real country music historian. DM: Last year I caught your show in Ames at ISU. You said that night it was your first show in Iowa. Were you surprised at the number of people that knew your songs? CL: Completely, that was a fun show. Kind of loud in that place, but a fun show. It’s funny because in America it’s kind of strange. It’s really random, some regions know every word and others no one knows us at all. Our growth down here has been very organic, it’s word of mouth, internet stuff and satellite radio stuff. It’s been kind of regional and kind of random. Like if you have a big media machine behind you then you can blanket the country I guess, but our growth down has been “some here, some there” kind of warm-uppish. By the time I’m eighty years old I’ll have the whole country covered. 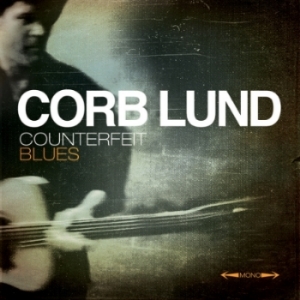 Corb Lund’s album Counterfeit Blues is now available from New West Records.